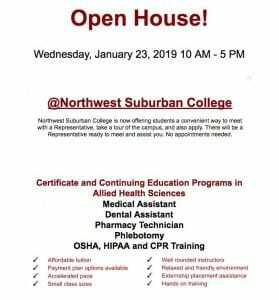 Come visit our table at the Annual High School College Fair and learn about the allied health programs and opportunities offered at Northwest Suburban College. 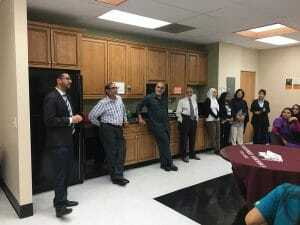 All are welcome to visit our campus and learn about our certificate programs. You will have a chance to visit our classes and labs, meet instructors and staff, and enjoy free refreshments. Calling ahead to 847-290-6425 is appreciated, but not necessary. Please stop by on April 24, to learn about these programs and the rewarding careers in the health sciences field. Representatives from the school will be available to share information about our allied health programs. We look forward to participating in this important community event!